A reporter arrested while videotaping demonstrations in Ferguson, Missouri, in the aftermath of the shooting death of black teenager Michael Brown is heading to court, the first of about two dozen journalists taken into custody. 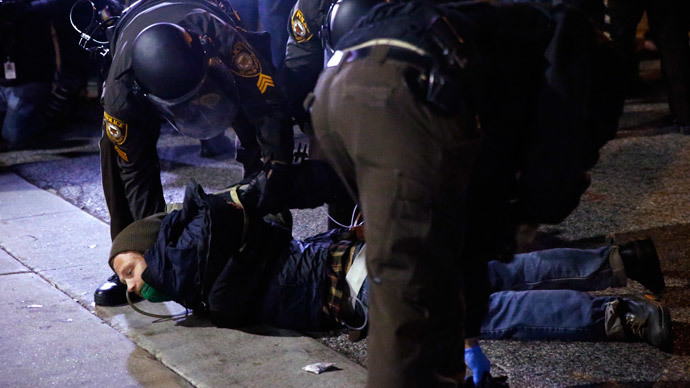 Mary Moore, whose videos have been used by the Associated Press, was among 13 people arrested by police during a demonstration outside Ferguson police headquarters on October 3, 2014. Moore claims she was only shooting video, but was nevertheless taken into custody by police amid violent protests after ex-Ferguson Police Officer Darren Wilson shot and killed 18-year-old Michael Brown. Moore, who has been charged with failure to comply and resisting arrest, is among the few journalists actually to get their day in court. She insists she was not taking part in the protest, but was simply documenting the events. "There was no resisting," she told AP. "I'm not an idiot." Following her arrest, Moore and 12 protesters were transported to a jail in nearby St. Ann, where they were forced to change into orange prison garb. They were detained overnight in a single cell with other individuals arrested for unrelated reasons, she said. Moore said the arrest has been a source of stress. "There is nothing worse than being accused of something when you know you don't represent that," she said. "I take pride in being a civic person. When you say I did these things and you know better, that's a problem for me." 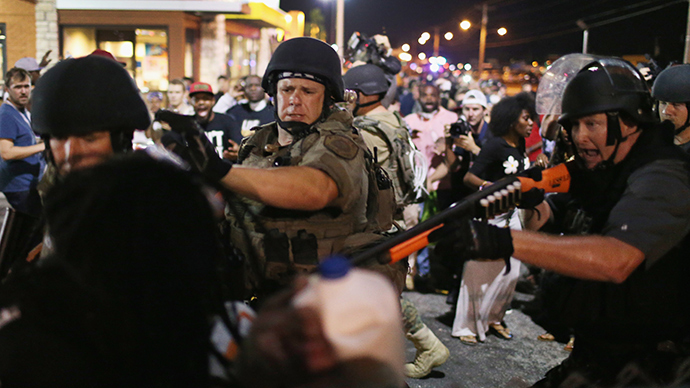 According to the San Francisco-based Freedom of the Press Foundation, 19 journalists were arrested in Ferguson in August, one in September, two in October and two in November. About a week after Brown’s killing, a police officer in a separate incident was filmed yelling at a reporter for flashing a light from a video camera into the officer’s face. "Get down, get the f*** out of here and get that light off, or you're getting shot with this [indicating his firearm]," the officer could be heard yelling at Mustafa Hussein, a reporter from KARG Argus Radio. Robert Mahoney, Deputy Director of the Committee to Protect Journalists (CPJ), said at the height of the protests that the police tactics would not prevent reporters from doing their jobs. 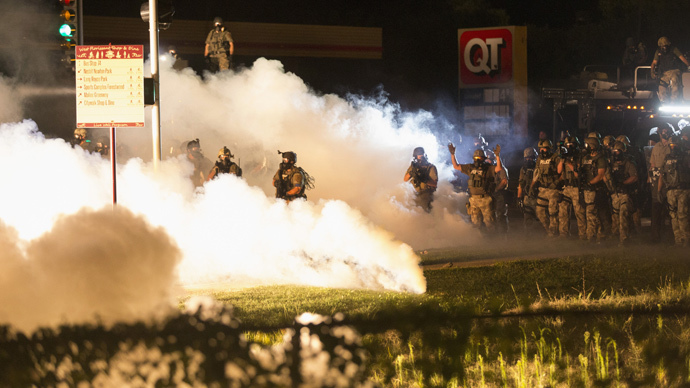 "Ferguson is an international story and journalists are going to cover it. They have a right to do so without fearing for their safety or liberty," Mahoney said. "The harassment and detention of reporters must stop. From senior commanders on down, the word must go out to security forces to let journalists do their job." Trevor Timm, executive director of the foundation, said witnesses and video evidence indicates that most of the journalists arrested in Ferguson were simply trying to cover the events. "The police were acting on a hair-trigger and weren't respecting the First Amendment rights of both journalists and protesters," Timm said. Police leaders have defended their officers’ actions. Missouri State Highway Patrol Captain Ron Johnson, who supervised security in Ferguson following the shooting, said it was often difficult to differentiate journalists from the protesters. The only event that triggered more arrests of journalists was the Occupy movement in 2011 and 2012. Josh Stearns, director of journalism and sustainability for the Geraldine R. Dodge Foundation, said more than 90 journalists were arrested in 12 American cities during the protests, which focused on the alleged misdeeds of the financial world.